Making your home safe for your intrepid little explorer is an essential task that requires vigilance and getting down on all fours. Keep these simple tips in mind as you try to stay one step ahead of your curious baby. Identify the hazards This might seem obvious, but the terrain is entirely different from a baby’s vantage point. Before you start rearranging furniture and purchasing child proofing devices, get down on your knees and take a crawling tour throughout your entire home. You’ll be surprised by the number of risks you uncover down there. Purchase safety aids After assessing the hazards, make a list of what you’ll need to make your house safer. You can find helpful items like electrical outlet covers and cabinet latches at select Pharmaprix stores. If you’re feeling overwhelmed and not sure where to start, contact a baby proofing specialist who will come to your house and address the risks for you. Monitor your own actions. Do you use your curling iron, and then leave it on the counter to cool with the cord hanging down? Do you leave the door open while bringing groceries in from the car? Does your older child leave out toys that have small pieces? Behaviours you never thought twice about before having children can be extremely dangerous to babies on the move. As you identify these risks, figure out how you’ll deal with them moving forward. Don’t underestimate your baby. You might think your baby is incapable of moving about and getting into trouble, but you’ll be amazed at how quickly motor skills can develop. One week your baby might be content to just lie on a blanket and play—but by the next week, he could easily make his way across the room. Similarly, as fine motor skills develop, small objects on the floor like loose change or dropped food could be easily picked up and swallowed. Keep your eyes open. 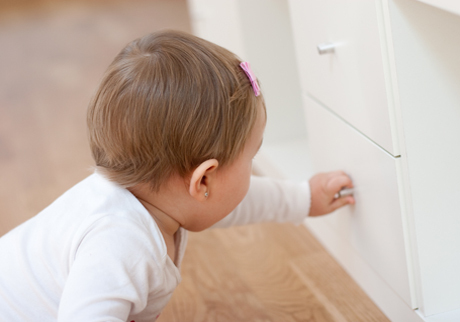 Remember that baby proofing is never a one-time task. As your baby grows and becomes more adventurous, you’ll discover new risks that will need to be dealt with in order to make your home a safe place for your little one.